Usually a comfort food cookbook is full of delicious, heavy "feel good" recipes. Yes, there are some. But this selection has many delicious, full flavored, colorful and healthy treats. The photographs are gorgeous and I found many "new" ideas for recipes of the foods that I love and crave. I want to own this one. 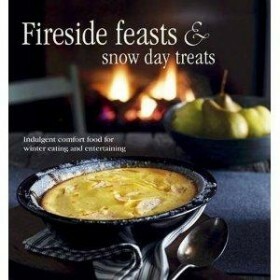 I hope you will try this book if you love to cook or if you just love to read cookbooks. 10 out of 10. Bought by my parents as a cute Christmas gift after we'd had a wood burner installed. It has become my favourite cook book. I drag out the cold season as long as possible so that I can justifiably use it and look forward to getting it out again as soon as autumn starts. I'm not a chef, nor do I even enjoy cooking much and am generally overly critical of my own cooking, ("is that corner slightly over golden brown? it fails! zero stars for me!") but the food is just sooo good that I can't help but continually pick out recipes from it to try. If I absolutely had to pick out a bad point about the book, some of the ingredient lists are quite long, but I think of it as a treat/comfort meal and don't mind planning ahead to make sure I've got all the ingredients in stock. I borrowed this book from the library on a whim and I'm so glad I did. This book has a diverse range of dishes that are unusual, easy to read as well. I'm yet to try recipes but I already have a few planned for this weekend. Highly recommended. Would make a great gift.